The error is caused be the logged-in account having insufficient rights against the SharePoint databases. 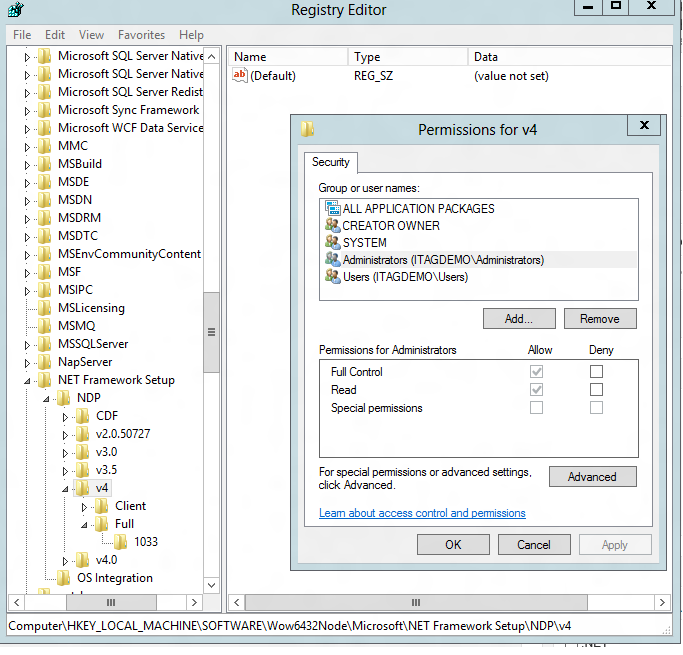 install the IIS 6 Management compatibility/IIS Metabase and IIS 6 configuration comptatibilty. One of features used in testing of permissions in SharePoint is “Sign in as Different User” which allows you to log in as an another user. With SharePoint 2013 this option is missing. Microsoft has published a KB article on the same : http://support.microsoft.com/kb/2752600. 1. Open the Explorer and navigate to C:\Windows. Right click on regedit.exe and click Properties. 2. Go to Security tab page and click Advanced button. 3. Click the Change (from the second line – Owner) and in the following textbox write Administrators and click OK. Click the Apply button from bottom right area. 4. From the users list select Administrators and click Edit. Grant Full Control and Save. Apply. 5. Make sure all changes are applied. 6. Now, right click on regedit.exe and Run as Administrator. 7. Navigate to the node (as in the image )and right click on the Full folder and click for Permissions. 8. Go to Advanced area (click Advanced from the bottom) and make sure the Owner is “Administrators” and not “TrustedInstaller”. Otherwise, make the change, give the “Administrators” user full control and apply the settings. 9. Now you should be able to change the version number. 10. After all these steps you can run the Visual Studio 2012 Express installer.